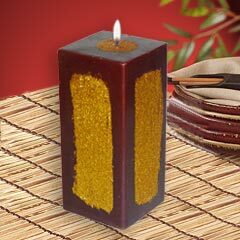 This Double Wick Gold Painted Pillar Candle will add an exotic decor to your home. Hand crafted and painted with gold sprinkles its sure to be an elegant addition. 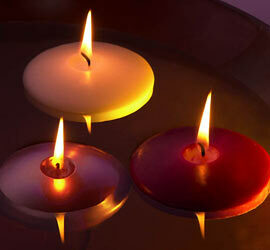 The double wick really adds to the presentation when lit and creates a nice atmosphere. 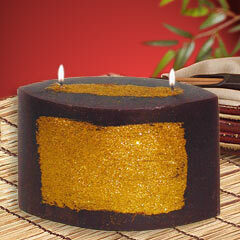 For a custom accent to any area try our Gold Painted Glitter Square Pillar Candles. Great for adding accents to any room and they look amazing lined up in a row. It's hand brushed with gold glitter on all four sides and will provide an ever-changing and long lasting light to your immediate environment. 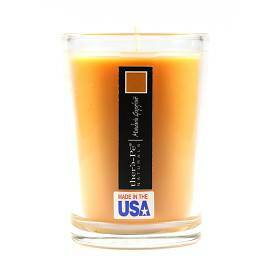 These unscented floaters are known to be some of the best burning floating candles in the country! Available in a variety of colors to suit any time of the year and with any fashionable decor. Very popular for weddings and special events. Make sure to pick up a floating candle bowl if you don't have one. Also mix and match different sizes and colors for a nice effect. 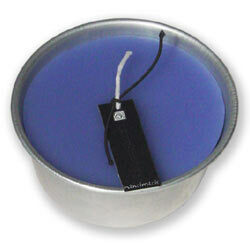 This beautiful glass candle comes in a very nice satin bag and makes a great gift or addition to any home. The color of the satin bag is the same as the color of the candle wax. It has a burn time of 25 hours and comes in assorted colors. Unscented.